Android Lollipop: Everything you need to know | What Hi-Fi? Google has announced its latest update to the Android operating system, Android Lollipop, which will work across phone, tablet, wearables, Chrome OS and in-car systems. Back in June, Google held its annual I/O (input/output) developer event in San Francisco – and part of it was dedicated to the latest version of its Android operating system, Android L.
However it wasn't until the general release of the software that Google unveiled the full name of the latest iteration of Android. Following the trend of all things sweet, Lollipop is the name of choice. When can you get Android L? 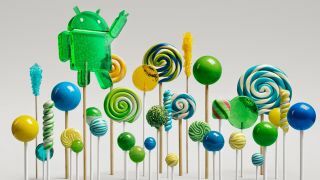 Developers have been able to get their hands on Android Lollipop since June, and have begun to create and tweak apps to work with the raft of new features on offer. The best way to get Android Lollipop is purchase one of Google's newly announced devices; the Nexus 6 smartphone or the Nexus 9 tablet. Both will come running the new software when they're released in November, although UK prices have yet to be announced. Google has said owners of the Nexus 4 and Nexus 5 smartphones, as well as the award-winning Nexus 7 tablet and Nexus 10 will receive the update "in the coming weeks". HTC has confirmed it will bring Android Lollipop to its devices, saying in an official statement: "HTC is excited about the new features in Android L and we can't wait to share them with our customers. We are committed to updating our flagship HTC One family as fast as possible." "We will begin rolling out updates to the HTC One M8 and HTC One M7 in regions worldwide within 90 days of receiving final software from Google, followed shortly thereafter by other One family members and select devices." Sony has confirmed the entire Xperia Z line-up of smartphones and tablets will receive the update too. The Xperia Z3 and Z2 will be the first to benefit from the new features, with Sony saying they'll receive the update "at the beginning of 2015". The rest of Sony's mobile device repertoire will receive the update sometime after. How does Android L look? 'Material' is the name Google has given the new look of the interface of Android L. In a twist from current user interfaces that have a 'flat' look to them – see iOS 8 – Android L will sport an interface with plenty of animation. it will still look 'flat', but it will incorporate shadows and ripples. Google says this will provide a more intuitive interface than we've previously seen. Other aspects such as the font and on-screen buttons have been redesigned too, and all these changes will be the same across every Android device you use: smartphone, tablet, wearables, Chrome OS, Android TV and in-car systems. Google has given notifications in Android a thorough going over. With L, you'll receive only the most relevant information from apps and, over time, Google will learn which notifications you're most interested in and prioritise accordingly. Not in a creepy way, honest. Another new feature is that notifications will now appear at the top of the screen if you're within another app. Anything from calls and texts to social network notifications will all pop up, giving you the choice of how to respond. On the subject of the lock screen, Google has stepped up security while also making it easier to access your phone. If you're wearing a Bluetooth device paired with your phone, you'll be able to access it without needing to type in PINs or passwords. If you're not wearing a device, the phone will require a code to be unlocked. Google has been tinkering with the way Android L is put together. As a result, it claims to be much faster than Android 4.4 KitKat as it now runs on ART as standard. ART was an optional runtime found in KitKat that improved performance. You should notice an immediate difference when using an Android L device, as ART is more memory-efficient than previous iterations of Android. For the consumer, this also means that multitasking will be improved, as background apps will have more megabytes of data on hand. Gaming on Android L devices will hopefully see a welcome boost too. Google has created an Android Extension Pack which aims to bridge the divide between mobile and PC graphics. The result? "More realistic environments, more realistic characters and vastly improved lighting." We shall see. Battery life is another area that should be improved. Google has developed a battery-saver mode that will come as standard on all devices and which claims to offer up to an hour and a half of extra battery life. Project Volta will also be able to show users which apps are draining power in more detail than before. Android Wear is Google's version of Android specifically designed for smartwatches and other wearables. Square and circular displays are both supported and at the I/O event the Samsung Gear Live and LG G Watch were both launched. Motorola's Moto 360 smartwatch is expected to be released later this summer. Android smartwatches will primarily be controlled by your voice, however you will be able to swipe through different windows – up and down to change apps, left and right to go further into those apps. Android Wear watches will connect to your smartphone and show all manner of notifications as well as other information such as turn-by-turn navigation in Google Maps. Google has released an SDK to allow developers to create apps for the watches, meaning they won't be reformatted to fit the screen. When an Android Wear watch is connected to a smartphone, they will "talk" to one another to see if any apps on the phone have watch compatibility to save you downloading a separate app for the watch. Google's smart TV platform, Android TV, will also receive the Android L makeover. You'll be able to search for content on your TV, via your smartphone or Android Wear smartwatch. Android TV also gives you the ability to search for anything with your voice, much in the way you can on your smartphone now. Ask it anything, such as "Oscar nominated movies from 2006" (the example given) and it will return results on your TV. Initially, Android TV will return searches from the Google Play Store, but if you have any other video streaming apps installed you'll be given the option of watching them on there too. We've already seen Android TVs from Philips, but other manufacturers, including Sony and Sharp, have also jumped on the Android TV wagon and will be including Android TV on their 4K TVs. But Google has released its own Android TV set-top box in the form of the Nexus Player (pictured). Manufactured by Asus, the Nexus Player will allow users to access content from "almost any" Android or iOS device, as well as Chromebook, on their TV. It'll be available to pre-order from October 17th. Acer and Razer have both said they will be producing set top boxes with Android TV installed, too. Google gave more details on its Android Auto in-car platform at I/O as well. Android Auto actually runs on your smartphone, but it's contextually aware so it knows when you're driving, for example, and produces a simplified UI to reduce distractions. Apps and services used on the smartphone are then mirrored on your car's display. Controlling the service can be done by either touch or voice command. Android Auto works much in the same way as Google Now. Google gathers data and provides you with information as and when you need it. For example, if it's 8:30am , it knows you're probably driving to work and so will give you navigation recommendations. You will also be able to respond to texts and emails via voice command too, leaving you to keep your hands on the wheel and eyes on the road. The benefit of Android Auto running on your smartphone means apps and services are regularly updated and data and search information that Google has gathered already lives on your phone. Google has said over 40 partners have signed up to the service, including Audi, Mazda, LG and Panasonic. When Android L is released, there won't be many places to hide from Google. Naturally, Google hopes you don't see that as a bad thing and instead embrace Android across as many platforms as possible in order to let Google work for you. And many of the new features certainly sound impressive. A refreshed design sounds welcome, while the moves in to TV, in-car adn more offer plenty of potential. Many will compare Google's latest developments to those found in iOS 8, and for now Google seems a step ahead. With Apple yet to enter the wearables market, with rumours of an iWatch still only rumours, Google has certainly got ahead in this new market. That said, Apple has never worried about being first – instead simply focusing on being the best.